A baby died on Feb. 7 after he was mauled by the family dog in Guthrie, Kentucky. WBKO reported that they responded to a home where they found a 1-year-old child on the couch, unresponsive, but still breathing. The child had abrasions to the head, chest, and neck. Police said a pit bull mix attacked the boy, according to the report. The child’s great-grandmother was also injured in the incident and had contusions on her left cheek and arm from trying to pull the animal off the baby. According to the report, the boy was attacked as he was playing with a ball on the floor. “She suffered herself from some very deep cuts and bites and stuff on her cheek and on her left arm,” said Chief Dean Blumel, of Guthrie Police. “She was in pretty rough shape. I commend her for reacting the way she did,” he added. The dog might have been scared by a thunderstorm in the area and reacted to the ball when it came inside, officials speculated. “It’s a family dog. The grandfather told me that it normally is playing with the kid and interacting with the kid very calmly, so we just feel that it was just an unfortunate freak accident,” said Blumel. A 1-year-old boy in Guthrie has died after being mauled by the family dog. The boy was rushed to Tennova Medical Center but later succumbed to his injuries. The great-grandmother was treated and released from the hospital. The animal was handed over to Animal Control and euthanized. A pit bull in Westchester County, New York, was described as a hero after breaking out of its home to save its owner. Sadie, a 60-pound pit bull, was found wandering around Tuckahoe, CNN Wire reported. Police first thought Sadie was a lost dog, but then they realized it was on a mission to seek help, the report said. An 11-year-old pit bull is being hailed as a hero by police and her owner after she forced her way out of her home and alerted officers to a natural gas leak inside. “We got a call of a loose pit bull,” Lawrence Rotta of the Tuckahoe Police Department told the network. When police tried to catch the animal at 3:30 p.m. on Feb. 6, Sadie bolted back to its owner’s home on Fairview Avenue. After Sadie and police arrived on the scene, officials noticed a sliding door was open. “When they went to investigate they noticed an odor of gas emanating from the doorway,” Rotta was quoted as saying by the news outlet. Rotta said there was a gas leak at the home, and police think Sadie broke out of the home to try and warn others or seek help. “I don’t know. I want to say bringing them here. What else could it be,” Serena Costello, the dog’s owner, said about what she thought the dog was doing. Costello wasn’t home at the time, but she called her dog a hero. “An explosion. I have no idea,” Costello predicted about what might have happened. She said that Sadie probably smelled the gas, began scratching at the door, before opening the sliding door in the kitchen. Costello doesn’t know how the dog got the door open, however, according to the report. Police called the local fire department and ConEd. The gas was turned off. 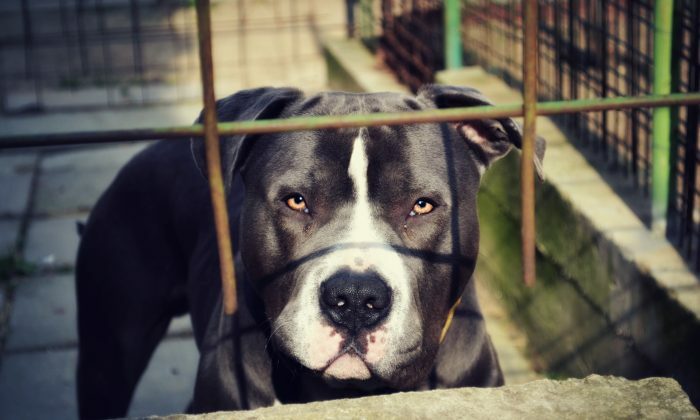 “Pit bulls are left at shelters in record numbers—and since they are difficult to adopt out, reputable shelters (that don’t slam the door in the dogs’ faces) are finding that they must euthanize more pit bulls and pit bull mixes than all other dogs combined,” the group said. Karen Delise, research director for the National Canine Research Council and author of “The Pitbull Placebo,” has investigated hundreds of dog bite incidents. She wrote in a now-taken down article: “My study of dog bite-related fatalities occurring over the past five decades has identified the poor ownership/management practices involved in the overwhelming majority of these incidents: owners obtaining dogs, and maintaining them as resident dogs outside of regular, positive human interaction, often for negative functions (i.e. guarding/protection, fighting, intimidation/status),” according to a prior report from The Epoch Times.